ALBANY, N.Y. (AP) — If anyone could emerge from the AIG bonus debacle looking good, it could be New York Attorney General Andrew Cuomo. Cuomo. KWOH-moh. Italian, I suppose. I have no personal animosity toward Mr. Cuomo, but despite his favorable write-ups in the press, he is certainly no hero in these matters. Americans have short memories. Even members of the press — or “the media,” as you now call them — who should provide context and perspective, have short memories. Set the Wayback Machine to 1995. Bill Clinton is president and Henry Cisneros, the Housing and Urban Development (HUD) secretary, institutes a requirement that 42 percent of the mortgages financed by government-sponsored entities (GSEs) Fannie Mae and Freddie Mac serve low- and moderate-income families. Fannie also developed a “flexible” product line, providing up to 100 percent financing and requiring borrowers to make as little as a $500 contribution, and bought $13.7 billion of those loans in 2003. That was not capitalism; that was government manipulation of the housing market. Americans have very short memories . . . So true. 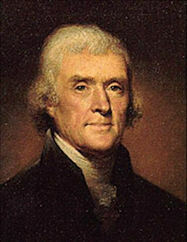 We need another Jefferson today, or at least a Reagan.